Yesterday, was the birthday of my lovely daughter.. Yep, she turned twenty three. when it was her birthday decided to give her a special treat., My kids love cake so I decided to make cake while surfing I came through ice cream cake from joy the baker blog .Assembled the cake as per her instructions.Home made icecream was in freezer I made Vanilla& strawberry ice cream,So I decided to go on a "Ice-Cream Cake". 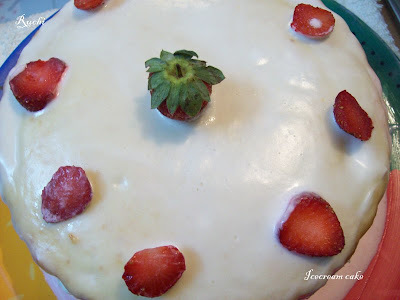 This vanilla- cake is simply irresistible slathered with your favorite frosting or layered in whipped cream and strawberries. Not difficult to make, The process of making the cake itself was fun. Just sandwich some ice-cream with vanilla cake and frost it all over with whipped cream . The top of the cake that I sliced off to create a flat surface tasted delicious with ice cream. 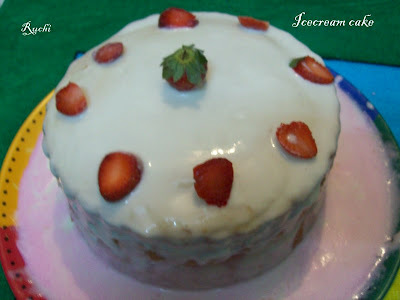 It was hard to resist licking my fingers as I spread the ice cream, and even the whipped cream was irresistible., I garnished the top of the cake with fresh strawberries and would go perfectly with the cake. Icecream melts faster! Look at the pictures below and you will understand. Due to continuous load shedding & summer heat makes my kitchen's temperature is just too warm. So while taken from freezer it started melting :(.This is the first time Iam making Icecream cake due to melted icecream it doesn’t came perfect.. Still kids enjoyed it! Sift all purpose flour, Baking powder ,baking soda , twice and set aside. Mix the flour and milk powder. Fold this into the butter-sugar. Adding the flour mixture and the milk, beginning and ending with the flour. Try to do this as quickly as possible so you don’t dry out the cake by over mixing. Add vanilla and mix. Divide this batter into two parts. Mix all the ingredients together gently. Do not over beat this. Refrigerate one part immediately. Pour in a greased pan. Bake in a pre heated oven till a tooth pick inserted comes out clean . Allow to cool on a cooling rack for 5 minutes.. Repeat step to bake another cake. Slowly turn the cake upside down and remove pan.. Allow to cool completely for frosting. Once cooled, loosen the edges of the baked cake with a butter knife, Return 1 cake round to one of the 8-inch cakes pans and place the other cake round on a plate. Place both cake pan and plate in the freezer to begin to freeze the cake rounds. Remove the cake that’s in the cake pan from the freezer. 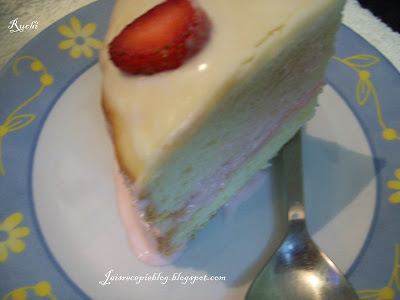 Using the back of a stiff spatula, spoon the strawberry ice cream into the cake round, on top of the first layer of vanilla cake. Remove the plated vanilla cake layer from the freezer. Place the second layer of vanilla cake inside the 8-inch round, on top of the strawberry ice cream. Return pan to the freezer to set for about an hour, depending on how soft your ice cream became while you were shaping the cake. Make Whipped Cream Frosting and store in the refrigerator until ready to use. After 1 to 2 hours in the freezer, remove the cake pan. Run a butter knife under hot water and run the knife along the cake, in between the cake pan and the ice cream cake to loosen the sides. Quickly frost Ice Cream Cake with Whipped Cream Frosting. Return to the freezer to chill. Decorate the cake as you like. wow Jaishree. I love strawberry too. Cake looks so tempting and that too in this weather... wow..BTW v have a India trip next month. I will be there for couple of months. it was d best cake eva made by amma..
i really loved it amma..! wsow! This looks so inviting! beautiful cake! 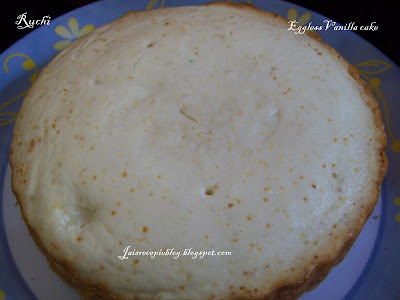 Hi,I am new to blogging, and happened to see you recipe for the eggless cake.Looks tempting and delicious. great.. the cake looks so good J.
Cake looks lovely! Fabulous recipe! This looks beautiful Jaishree... Happy Birthday to your daughter! Wow jaishree awesome cake. very much tempting. Cake has come out really perfect and belated wishes to ur daughter! Convey my birthday wishes to ur daughter dear. Lovely cake and I am sure it worth more than anything. Looks fabulous, wish I could taste some ! The cake is looking good and tempting. Thank you for sharing.